What should Dave do with his Sinclair C5? New seminar, the “Hardware Workshop” will teach you how to start a hwstartup. How do you track your revisions for hardware builds? CotW: A resistor. A very expensive resistor. Dave hit 100,000 Youtube subscribers! 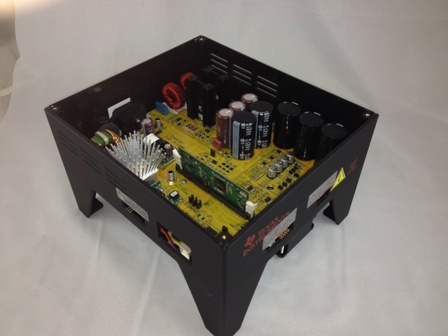 The TI TMS320C2000 Development Kit for high voltage motor applications (shown above). More about the motor application and all the math here. Amazon’s factories run with robots that bring shelves to the people that pack and pick items at the warehouse. Remember, next week on the show we’ll have Andrew Witte, CTO of Pebble Technologies (creators of the Pebble smartwatch). Get your questions in here! Chris has discovered VFD’s. Here is my favorite one I have been using for a few years. They are dumb simple to use and cheap. I think I spent under $90 each for the KBVF-13 which handles up to 1/2 HP and runs 120 to 3 phase 208 or 240 from 0 RPM to double nameplate RPM. They are fun to play with. We tried using our MRP system for keeping track of our BOM’s and it didn’t work and we tried using spreadsheets and they didn’t work. The BOM output of our PCB CAD software was useless. We finally settled on using Parts&Vendors http://www.trilogydesign.com. I’m looking forward to ordering a book from Amazon and getting my free quadcopter! I love it when in an episode Chris or Dave act super excited about something I look at almost everyday. The last time was on the episode where you guys talked about the Tesla motors factory. I work in an automotive plant so seeing and working on automation robotics and huge presses and variable frequency drives (VFDs) is nothing new to me anymore. Here you are in fields I think are fascinating all the while I am working with equipment that fascinates and seems novel to you. Can we switch for a few days? Ditto. Wow. I better be careful with that word. It’s an antique! Major hardware releases (PCB revs) can be tied to releases on the master branch, the development branch (and feature branches) can be used to make changes etc. Maybe a folder for hardware, software and documentation, then everything related to the project is in version control and you have a snapshot for each revision of everything.